World Carfree Day is an annual celebration of cities and public life, free from the noise, stress and pollution of cars. Each year on September 22, people around the world organize events of all sizes to showcase alternatives to the automobile. World Carfree Network invites organisations and individuals everywhere to join. World Carfree Day began as an open call for a grassroots celebration of cities without cars. The date, September 22, was chosen to coincide with the EU-sponsored European Mobility Week, but our hope is to involve people at all levels of society and from all over the world. 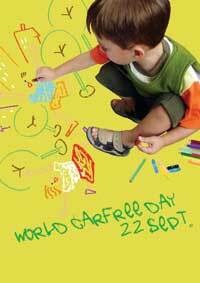 In 2000, Car Busters (the precursor to World Carfree Network) issues an open call for a "World Carfree Day," to coincide with Europe's carfree day on September 22. Since then, we have continued to call for activists and citizens to organise World Carfree Day events on or near September 22.